Boarding El Metropolitano BRT in Lima, Peru. Photo by EMBARQ. 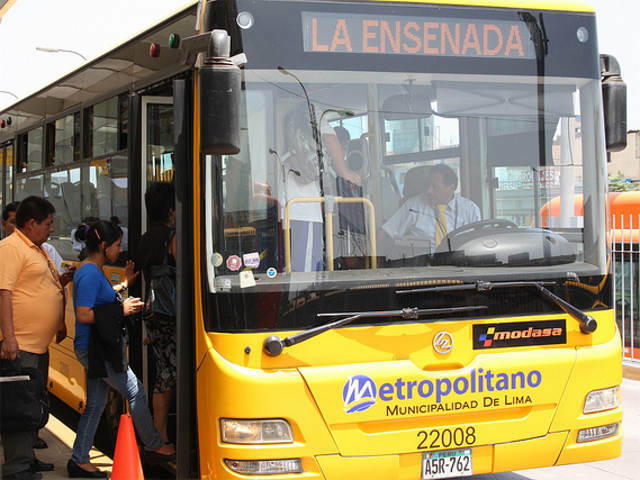 In a capital city with 8 million inhabitants, not only was Lima’s advanced bus system the first of its kind in the country, but it also provides valuable lessons for the rest of Latin America. Building on the Lima experience, other cities in Peru can be inspired to deliver the saved time and lives that El Metropolitano is delivering day after day. TheCityFix sat down with Hernan Navarro, Operations Manager at El Metropolitano to learn more about Lima’s advanced bus system. Navarro highlights key learnings about the 33-kilometer (20-mile) El Metropolitano system connecting 16 districts of Peru’s capital along a north-south corridor opened in October of 2010. 1. What makes El Metropolitano unique in Peru, and across the BRT world? What makes El Metropolitano so special in Peru, is that it is the first and only BRT system in the country; our buses also run on natural gas, which helps reduce tailpipe emissions. Also, Lima’s BRT has a “fast track” with no stoplights called the “Via Expresa,” on which only small vehicles, and El Metropolitano are permitted in the dedicated lanes. 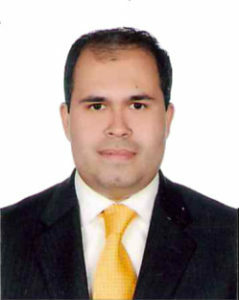 Thus, it saves a tremendous amount of travel time to the benefits of the inhabitants of Lima. 2. Is El Metropolitano integrated with other transport systems? To a certain extent, we could say it is integrated in a “casual way,” with the main, trunk line accessible by peripheral, non-BRT feeder buses. At certain spots in the city, minibuses have become the feeder system, forming a sort of natural integration, as they choose routes that can help passengers reach BRT stations, where they can continue their trips, with the benefit of a fast system as backbone. Additionally, we have planned a formal integration with the Lima metro system to come into effect in the coming months. The metro and El Metropolitano will be connected through the Gamarra shopping center station, the commercial heart of Lima. We see this integration as a way of responding to customer demand in a more effective way. 3. Since El Metropolitano began operations, have Lima’s roads become safer? Before El Metropolitano started working, there used to be around 30 accidents per month along the same route. Since 2010, the number of accidents per month has dropped by almost 90%, and we now have an average of three to four accidents per month. 4. What are the top three ways that El Metropolitano has directly improved people’s lives? Saving time: Some trips that used to take 2 hours in rush hour and can now be made in 25 minutes with El Metropolitano. Saving money: There is a flat fare for riding El Metropolitano, meaning that even in rush hour, and across long distances, passengers still pay 2 soles (USD$0.77). Saving lives: People feel safer, and there are significantly fewer accidents, as compared with conventional buses. 5. Do you have any advice for other municipalities in the planning process for a BRT, or considering it? What lessons could they learn from you? Be careful with contracts. Make sure that plans for necessary infrastructure and land acquisition are secured prior to making an offer to operators, so that you don’t experience later problems. Define the station sizes according to public demand. Some stations are more popular than others, and therefore should be larger. It is all about making the most out of the available space and adapting to customer needs. 6. How is El Metropolitano perceived among the general public? In a city of 8 million inhabitants, El Metropolitano serves 5% of the people. Yet when El Metropolitano is in the spotlight, its actions are closely followed and widely broadcasted by the media. Everything we do, whether good or bad is highlighted in the media and discussed among residents. 7. Now that you have surpassed 300 million passenger trips, what are El Metropolitano’s goals looking ahead? 1. Use all available buses: We have 522 buses, 96% of which are currently in use, but we want to have them all up and running. 2. Increase ridership: We measure ridership by passengers per kilometer (PKM) travelled along the corridor. For trunk-line buses we have a PKM index of around 6.5 and for feeders we have 3. Our goal is to increase these numbers to 7 and 5 passengers per kilometer, respectively. 3. Increase the value for the operators: In other words, help our bus operators increase their ridership and profit margin. Currently, we offer the operators an 85% of value per kilometer; this is mostly due to the fact that El Metropolitano only attends to 5 % of of Lima’s transport demand. We hope to build upon this. 4. Extend the corridor: We are extending the route 7 kilometers, from Naranjal to Patio Norte, in Lima. El Metropolitano addresses a historic need in Lima, a city which had been waiting for a mass transport solution since the late-1960s. Overall it is making progress, providing passengers a cost-effective and efficient way to go from point A to point B. While the system still has a long way to go in terms of passenger capacity, fare integration, and routes, El Metropolitano is steadily moving Lima step closer to a more sustainable, organized urban environment – a place where people want to live. Interested in learning more about El Metropolitano BRT in Lima? Visit their website. For more info on BRT in Latin America, check out the upcoming conference of the Association of Latin American Integrated Transportation Systems and Bus Rapid Transit (SIBRT). The Third SIBRT Congress: “Best Practices in SIBRT in Latin America”, will be held in Belo Horizonte, Brazil, June 4-7, 2013.